Consider adding DOWN BY THE RIVER (on-sale date: March 6, 2018) a heartwarming picture book about fishing and family to your book section this spring. 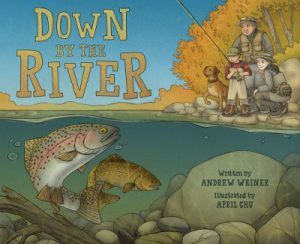 Written by Andrew Weiner, a longtime publishing industry vet and illustrated by rising artistic star April Chu, DOWN BY THE RIVER follows a young boy as he discovers fly fishing with his mother and grandfather. We’ve reviewed a copy ourselves, and found it to be beautifully produced, from words to images. It is an excellent choice as a gift to the young angler, the would-be angler, or the parent or grandparent who wants to nurture a future angler. DOWN BY THE RIVER is a celebration of the power of the sport to draw families together and back to cherished natural places. It is a multigenerational family story and the heart of the book is young protagonist Art’s relationship with his grandfather. Based on the author’s own decades of experience fly fishing, the book exudes a strong regard for nature. It includes extensive backmatter about conservation and fly-fishing equipment and techniques. DOWN BY THE RIVER has already garnered advance praise, including a starred review from Kirkus calling it a “authentic, heartwarming story,” as well as kind words from industry heavyweights Yvon Chouinard, James Prosek, Chris Santella, and John Gierach.